← New Corvair/ Zenith 750, Vance Lucas, Canada. Today I went out and bought 3 new 5 gallon cans to store 100LL in. As most of you have noticed, in the last few years, we have all been subjected to “Safety” spouts and pouring devices on new gas cans. Speaking as someone who has spent a lot of days in the burn ward, these devices are stupid, and are not the way to prevent accidents. Obviously, education is. You can’t make the world “safe” for imbeciles, and I personally resent attempts to idiot proof everyone’s world, in a futile attempt to protect those who are working very hard to remove themselves from the gene pool. Here is something ironic: The bag above contains a normal spout that replaces the “Safety” spout. Look at the states in which this device is illegal: right at the start of the list is California, Aka: “The People’s Republic of CA“. Notice that the actual Commies in China produce the device to defeat the pseudo-commie legislative “safety” spouts mandated in those 11 states and DC. Yes, I own a copy of Das Kapital, and I know it is an economic model, not a system of gas spouts. I think of anything that seeks to remove an individual’s right to choose his own path in life and replaces this with forced compliance with the alleged good of the masses as, for the lack of a better term, “commie”. Before anyone from California or any of the other States starts typing, please understand I have been to all 50 states – (State #50, North Dakota), I love CA (just not it’s legislature Water Bomber at twilight) , I think of Albert Camus as a great man (he was a commie – Thinking of the people of France) and of course I am just an opinionated idiot –Lifestyles of Troglodytes. 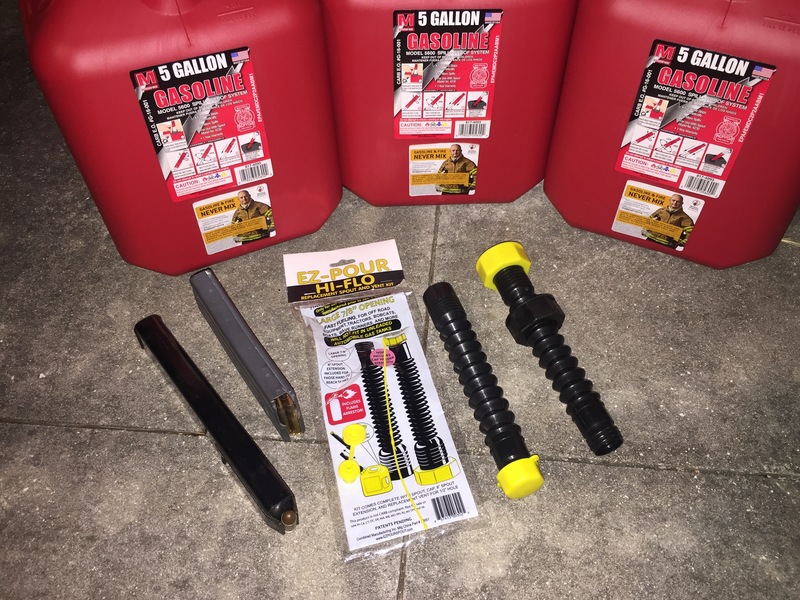 Something funny: Three 5 gallon containers, and two 30 round containers in the same picture. I don’t know who designed the gas containers, but the two others work with machines of George Hyde and Gordon Ingram (L) and Eugene Stoner and James Sullivan (R). 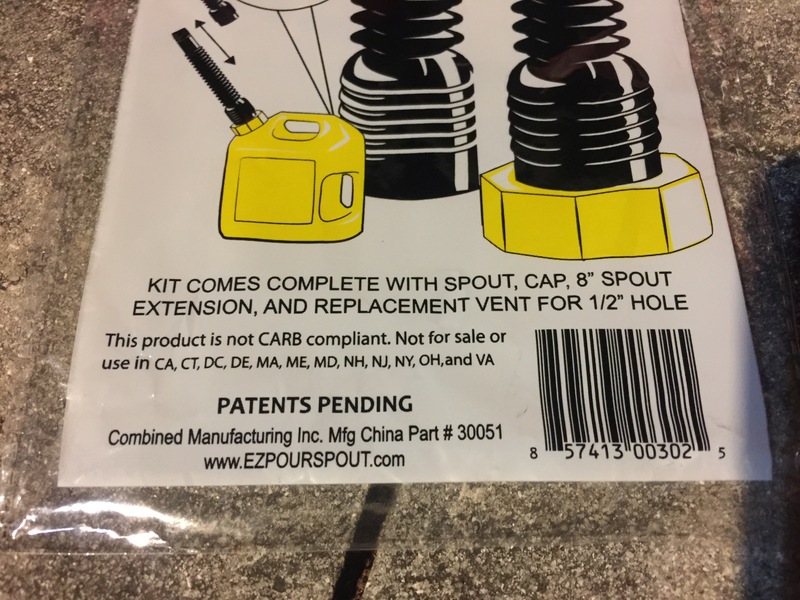 When looking at the list of states which forbid the use of regular gasoline pour spouts, it nearly overlaps exactly with states that forbid the mere ownership of the 30 round containers. It is all a misguided attempt to make the world ‘safe’ by removing anything that might be used by a fool or an evil person to cause harm, rather than removing the person who is doing the harm. One of the great things I love about aviation, is the fact it is one of the last bastions in American life, where the participants understand that it is a better investment in risk management to educate the participants rather than make a futile try to ‘idiot proof’ the machines. While I can’t fix your gas spout if you live in a “safety” state, we should both have loud vocal objections when anyone suggests they have an idea for idiot proofing aviation…..unless that idea is escorting the idiots off the airport. I was a mechanical design engineer for 30 years. We had a saying that if you made something idiot proof GOD would invent a better idiot. Flight planning be damned, I have Foreflight!!! I wonder how many “Pilots” cross check against their computer generated flight plans and navlogs before they mindlessly follow the megenta line?Hey, I still have a wiz-wheel and USE it! Am I a relic?It seems all this High Tech stuff IS aimed at idiot proofing aviation. Sometimes fast and convenient ain’t good.